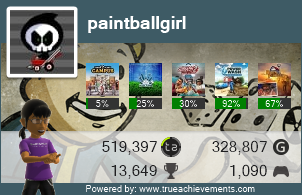 I’m paintballgirl, an avid gamer and tech geek. I appreciate both the technical and social aspects of gaming and hope to bring my love of gaming and technology to this site. I frequent quite a few gaming sites and wish that I had the best aspects of those sites all on one page. My vision for this site is a site that will provide you with news, deals, and my personal gaming updates. Most of my gaming is done on Xbox, but I also have Playstation products and play Games for Windows Live on PC. Since the site is new, the majority of news will probably be Xbox related, since it’s in my wheelhouse. As far as deals, I will try to include Playstation deals as well as Xbox deals. As the site expands, I will also include more deals on computer hardware and software, as well. Feel free to check out the links to some of the sites I frequent and feel free to use my Gamertag as referring you to the site, which will send a friend request to me, as well. If you have any questions, suggestions, or if there is anything that you would like to see covered on the site, you can contact me using the link below. Thanks again for visiting and come back often to see what this work in progress ultimately becomes!